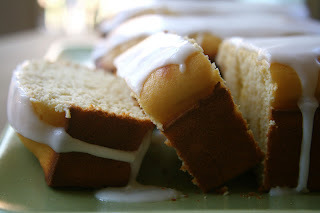 Gluten and Dairy Free Vanilla Coconut Pound Cake! Last week I shared a picture of a gluten free pound cake I made recently and stated that I would share the recipe soon. This is a recipe for Gluten and Dairy Free Vanilla Coconut Pound Cake I shared at Bob's Red Mill. The texture of this cake is perfectly dense with a delicate crumb. There is a slight hint of coconut that adds to the richness of these little vanilla cakes and a thick glaze on top adds a little extra sweetness. I'm sharing this on Simply Sugar and Gluten Free's Slightly Indulgent Tuesday. That looks awesome. Love the drizzle of glaze. This looks beautiful - just not too beautiful to scarf down! Love it. ooooh, Sarena you have DONE it. 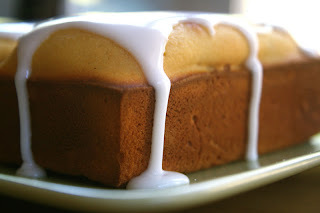 pound cake is one of my favorites (as is vanilla...) and this just looks perfect! I can't wait to try it! Look at all that glaze!! Oh my dear, could you have made that look any more perfect? This looks fantastic. I've been in the search for a great GF quick bread. Thanks for posting, bookmarking for sure! I'm in love with pound cake but haven't had it in forever!